We all have heard of Warren Buffett. Although known for his success as an investor and personal wealth (in 2008 he was listed as one of the wealthiest man in the world), he advocates the importance of saving money and philanthropic giving. He only leave $10 millions to his descendants, and the rest to the Bill and Melinda Gates charity. And he also give out his tips for success. In 1950, at age 20, Buffett had already saved $9,800 (that’s around $94,000 today). Six years later, at age 26, that number had skyrocketed to $174,000 (which is $1.47 million today). How did he do it? Here are a few tips to save money that he gives liberally. “Do what you love”. If you can make money doing something you love, you’ll be happier. This means you’ll spend less money trying to make yourself happy with things. He says if you can’t get a new job, do what you love as a hobby and try to make a little money doing it. It will still give you lots of fulfillment. This is one of his greatest advise. From a very young age, I wanted to be a healer, so I grow up getting into the healthcare profession. I get to do what I love doing, and making money along the way as healthcare professional get compensated very well. “Do not depend on a single income”. Create a second source of income for yourself so that you won’t be totally dependent on your job. This may be through smart investing or the side income you make from tip #1. After his early success in business – He bought a railroad company, insurance company (geiko), financial company (BAC and WFC, earlier than that was UBS and SunTrust), he has the whole mindset of diversification. He was also into silver in the 90s making boatload of money. His only regret was selling too soon. He also bought some farms in New York State recently. And don’t forget his beloved American sport, Baseball, in Omaha, he owns it too. “Don’t buy compulsively”. If you can’t write down an actual reason you need to buy a particular item, then you probably shouldn’t buy it. He says, “If you buy things you don’t need, you may soon have to sell things you do need.” Continue to live very modestly, when the man of his statue can have multiple mansions. If you have this problem, just go to a Buddhist monastery, and live the life there for about a week, some might take longer. Someone figure to support a monk or a nun, it only costs $435/mo. And you’ll see them smiling, very content, very peaceful. Imagine you stand to spend way more than that a month, why are you suffering? Wouldn’t it inspire you to curve some of your spending habits? “Respect all of your money as if it were the last $5 in your pocket.” This perspective will help you value your money and put more thought into how much you save, spend, and invest. When my parents took a down turn in their business, and we were going through some hardship. Then, I learned how important it is to save for rainy days. People can have the mind set that it’s only $5, it can’t do anything with it. I remember this one article Buffet was saying how to turn $40 into $10 million today by buying Coca Cola stock in 1919, and keep it until today. So yeah, saving a little here and there, but collectively, with compounded interest and dividends, it can turn into a big number. I wrote about 7-ways to invest to become a millionaire. In conclusion, if you have an opportunity to save, and you can comfortable living in your own skins and don’t let the peer pressure get you into buying stuff just to keep up with the Jones and strong enough remove yourself from the situation or withstand the pressure of upping the lifestyle. You can save a lot more than you think, and turn all of that saving into working capital. You can reach your goals faster. Very good advise and reminder there. W.Buffett is not just a legend in investing but also his preaches that have touched people like myself over the course of my lifestyle. He is definitely a legendary in our lifetime. 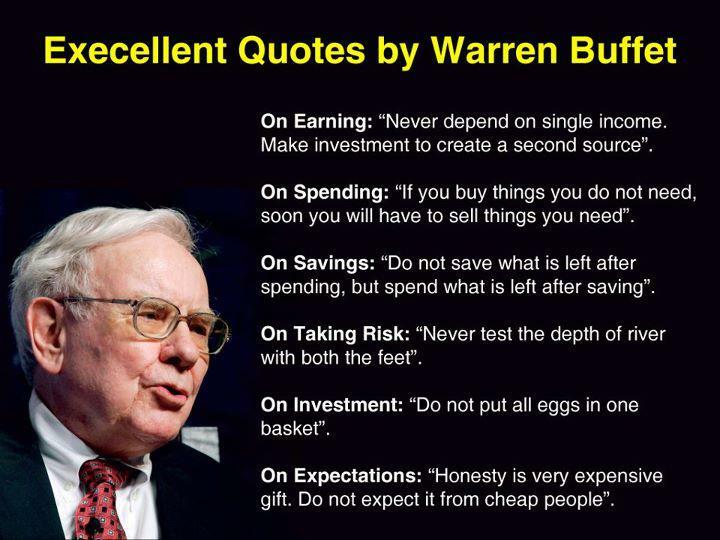 Warren Buffett is a legend when it comes to saving and investments. I remember a few years back, he said he was going to invest in BurgerKing, and the stock is doing well so far. He makes great points, such as trying to get a second income. That’s definitely something I am trying to do – whether through real estate or dividends. Amazing how much he had saved at a young age! Yes, I wish I have his courage when I was younger. Warren Buffet is not only one of the best investors the world has ever seen, he shares his expertise and knowledge with his followers. If you follow his advice, you will be financially free in no time! Cnbc and Cramer today hit hard on people trying to mimic Buffett investments as he has already dump the oil stock in the 4th quarter, and people today has just learned about it. I bought the shares at the right time, I also dump them today after the news, I want to have the capital for a potential investment property or the next market dips. Will see if Cramer is right or not, but I know a lot of people are bearish on oil and the OPEC have too much money to care about the falling price. And there are companies or countries will continue to produce oil no matter what the price is. So, that’s why we have this oil situation. One thing though: Warren Buffett didn’t start out with nothing. He had $200k by the time he was 21, which is equivalent to $2 million today. His father was also a Congressman, which means he must’ve had some pretty good connections. I read somewhere that he earned his money, didn’t use his inheritance or anything. Now, being a son of a politician has it’s advantage. Good to point out. The fifth bit of advice from him jumped out at me the most. Often frugal people have good money management and understand the concept of a dollar. To some $5 is nothing, but should it be seen that way? $5 can buy a meal or it’s what some people live on in a day (food wise). I remember $5 is my dad got paid for a week of work. That was in ’92. Enough to feed my family. $5/hr that was my pay for working at a gift shop in high school, 1998. I remember saving every bit of it toward college course in the summer. Each credit was $40. My school counselor didn’t allow me to take advance course. They tried to say I wasn’t good enough, and I took college course while I was in high school, just get my dad to sign the release paper work. Not only I passed those courses, I aced them with A’s. After that, they backed off a little allowing me to take advance classes. I told them I want to do medical school, by them holding me back would not prepare me enough for college. That’s just a side story, heheh I’m glad my parents believed in me. That’s why I’m supporting my Dad each month, I am his retirement, he invested in me, now i have to pay back interest. Hehe. Yup! His $5/week salary paid off big for him now. I totally agree with you Viv… I also don’t spend money on useless things that I don’t need. Some people would want to have expansive stuff but highly in debt. I think it is pretty stupid for doing that.